GI Integrated Remittance and Banking Correspondent platform provides a powerful suite of products and services that facilitate the bank to grow their agent led business fast. This platform enabled easy appoint of BC partners or BC / Specialized agents who can acquire customers for banks, issue mobile wallets or create accounts to new customers, facilitate domestic money remittance, issue of cards through wallet, Cash in/ Cash out, CMS, other financial and banking transactions. This platform will synchronize with the core banking systems on a regular basis or even live. 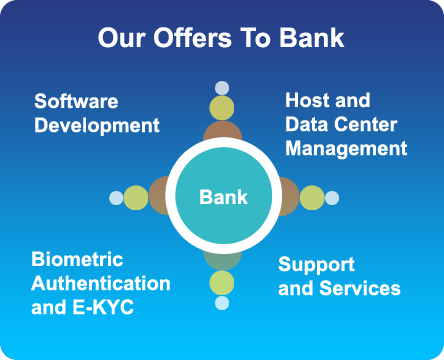 GI Integrated Remittance and Banking Correspondent is used by leading private banks like YES BANK who are market leaders in retail domestic remittance and urban financial inclusion and now 3 more customers are going to go live. GI Remittance Engine is a core module of the GI Integrated Remittance and Banking Correspondent platform is perfect for banks and PPIs who want solutions only for their retail domestic remittance business. 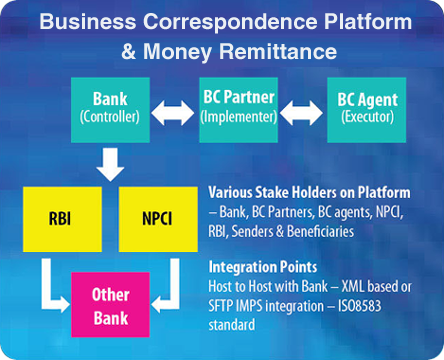 This remittance engine works on both IMPS and NEFT for P2A, P2P, P2M transactions with good back end controls and MIS. This is majorly used by banks and PPIs. GI's IMPS Transaction Switch which is the core of the GI Remittance Engine is now being made available as a standalone module for banks and financial institutions that want just the IMPS switching without the Remittance Engine. GI's IMPS transaction switch can be used on a standalone basis by banks and financial institutions for transaction processing, validations, refunds and settlements. GI Prepaid platform is powering leading PPIs in India. GI Prepaid platform addresses niche markets for its flagship ICASH CARD which has special features addressing pain points of specific industry verticals like educational institutions, travel service companies and large retail agent networks. Leading names like Lovely Professional University, DY Patil group of institutions, IRCTC use ICASH CARD. Wallet Management is a part of the GI Prepaid platform. This can be used for mobile, eCommerce and Physical card based wallets. Banks and financial institutions will find it useful for large volume B2B and B2C transactions.